Hi! Today I’ve decided to do a “How To” article. It’s fairly obvious, by reading the title, what I plan to show how to do today, but the reason may not be obvious. If you’re a seasoned blogger you’re probably already pimping a blogroll on your sidebar, but since I’m fairly new to this I had to figure it out myself. I got some help from friends who commented here when I asked about this very subject in a previous post, but before and beyond that I was on my own. I searched thoroughly, or at least I think I did, for a blog post giving instruction on how to do this. I may not have known where to search or how to search correctly, but I certainly didn’t find anything to help, other than the helpful friends who gave me advice on this when I asked in the earlier post. The first thing you have to do if you want to post a blogroll in your sidebar is, well… you have to have a sidebar. It took me a while to figure out why I didn’t have a sidebar, but in essence it was simply the theme WordPress had automatically started me with. It had a place at the bottom of the page and it had left right and center settings for anything I wanted to put there, but no sidebar. So you have to change your theme. This may not be too difficult if you’re new to WordPress, because you can just pick one you like, making sure it has a sidebar, and then edit any colored fonts you may have used in posts. For me it was difficult because I had almost 50 posts that I would potentially have to edit for colored fonts if I chose the wrong theme. (There were also quite a few frilly themes that had flowers and pieces of candy and such for place markers, which being a guy I decided I didn’t need.) I went through all the potential blog themes and decided on this nice Choco theme that sort of reminds me of a field notebook or something. It’s manly enough to bolster my “macho-ness” and still has a bit of creative flair to it. After you’ve decided on a theme and set up all the options you want for it you’ll be able to add a blogroll. You’ll still have trouble if you go to your Dash Board and look for it, though. There is no heading in the left column menu for “Blogroll”. What you want to do first is make a list of all the people or websites you want to include in your blogroll. Consider it your personal hall of fame. This is where you give honor to all your blogging or webmaster heroes. Don’t just include every website in your browser’s history. This is a coveted place of honor that people are constantly attempting to acquire. Be selective. My guideline is that unless someone appears in my Top Recent Commenters section in the Stats page for my blog, they don’t get put on the blogroll. (There may be a couple of exceptions to this, but that’s my norm.) Most bloggers seem to use a personal rule of only including blogs in their blogroll that will inspire their readers or compliment the content of their own blog. I think that’s a good rule too. It’s going to take you to a form that you’ll have to fill out, but it’s not as complicated as it looks. You can actually fill in everything on the form for each link you add, but at this point I’m only going to show you what you need to know to have that blogroll showing in your sidebar. 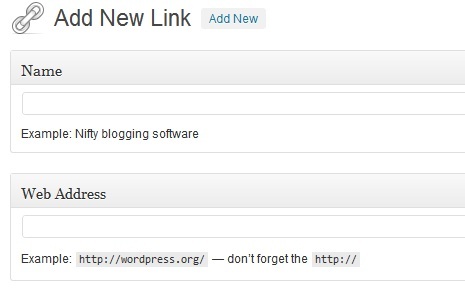 Now, The first thing you’ll want to do is add the name of the blog and then the URL goes in the next field right underneath the name. The name should appear the same as it does on the website you’re referring the reader to, but if you want to be funny or play a practical joke or if you’re trying to help a campaign to boost search results for that website, you can change that name to whatever is appropriate for your purposes. One last thing to do before you can add this link and move on to the next. You need to scroll down to the Categories box and choose categories for your link. In this case you can choose only the Blogroll category. 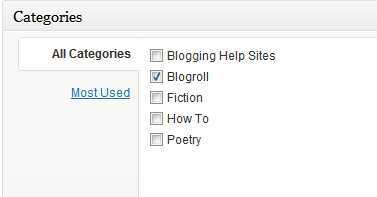 Add more categories if you feel they are appropriate, but Blogroll is the only one you’ll need now. Okay, the link is ready to add to your blogroll. Go to the top, right-hand corner of your screen and make sure the check box “Keep this link private” is not filled in and then click the “Add Link” button. The screen will reload and you’ll have the opportunity to add all the links in your list in one session without having to keep navigating back to the Add New Link page. Once you’ve added all the links you want on your blogroll you can then post it so the world can see it. 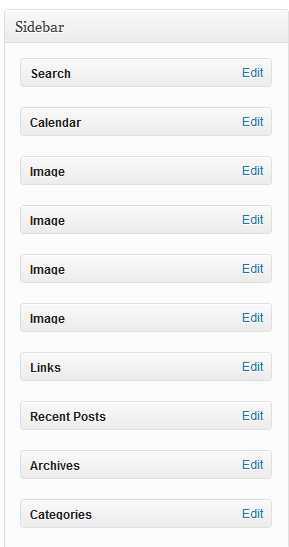 Your blogroll is a widget, so in order to post it you’ll have to go to the widgets page under Appearance on the menu to the left side of your dashboard. Just click on the link and it will take you to a wonderful page where you can pimp your blog out really nicely. There are widgets for calendars, images, videos and more, but today we only need one, the one titled “Links”. 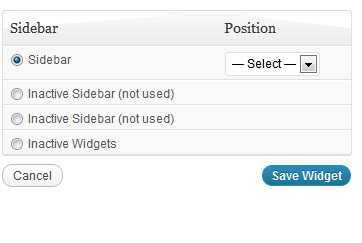 Before you do anything else, look at the right side of your screen and you’ll see a layout of your sidebar. If you already have other widgets on there, figure out where you want your blogroll to appear in the order. Count from the top and figure out the numbered position it will have. This matters in a minute, so remember it or write it down. 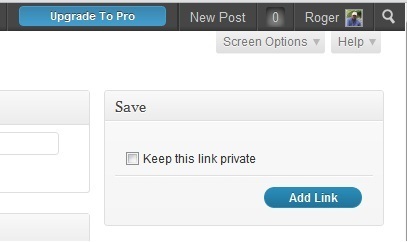 The widget we want for posting you blogroll is in the middle of the page when you first arrive there. You don’t need to scroll down much. It simply says “Links”, which is why I had so much trouble figuring out how to do this. (I should add that underneath it is a description, that I originally didn’t see, that tells you this is where your blogroll is going to be.) When you find that, click “Add”, which is going to open a widget configuration screen for you. Okay, you’ll need to select Blogroll for your first field and then you can select/deselect the other options as you see fit. 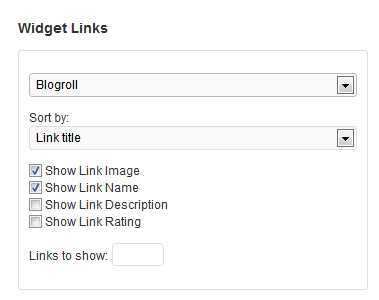 The second field allows you to choose the sorting parameters for your blogroll, determining which URL appears at the top, etc… The bottom box is for you to select how many links you want to show. This only matters when your blogroll gets big and you don’t want to fill your sidebar with it. Still, it’s nice to know how to decrease the size when you need to. 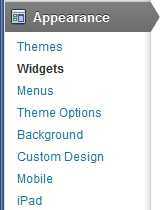 Once you’ve posted this widget you can always go to the widgets screen and select it from the sidebar and edit whatever settings you want. This is below the first box and it determines where your blogroll appears. If you have more than one sidebar, you can decide which one to put it in. Since I only have one, it was a no-brainer. Once you’ve selected which sidebar you want it on, select the numbered position I told you to remember from the widget screen. Then click on “Save Widget” Congratulations! You now have a widget on your sidebar! Go to your main blog page and admire it. I hope this helped you. Cheers until next time! Sure Casey. Since my post was about creating and posting a Blogroll I figured your post about updating your blogroll would be a fitting link at the end. I hope you enjoyed your visit to my blog. Feel free to browse around and comment on anything you see that interests you. Ah excellent and thanks for putting me there too! When I began I worked out how to add one and forgot it existed. The next time I tried it took me ages to get it but now reading your instructions made enough sense for me to add you – perfect! Now if only I could find out how to put links in things with the words I want instead of the actual link words! Thank you for putting me on your Blogroll. I am honored. And thanks for the how to….I still haven’t figured out that widget thing!